Concern has already been expressed about these developments. The National Institute for Health and Care Excellence notes that e-cigarettes “could, without regulation, be marketed in a way that may ultimately promote smoking,”4 and researchers have highlighted the need to monitor e-cigarette marketing.5 6 7 8 An analysis of e-cigarette coverage in the UK and Scottish press from 2007 to 2012 showed that newspaper stories often describe the products as a way of getting around smoke-free legislation and glamorise use through association with celebrities.9 We were commissioned by Cancer Research UK to study e-cigarette marketing and media coverage in the UK from May 2012 to June 2013, during the period when the Medicines and Healthcare Products Regulatory Authority was considering regulation of the products as medicines. We searched for mentions of e-cigarettes in the database Nexis UK, which holds the text content of UK national and local newspapers, as well as in trade press, tobacco journals, and television advertising (see web appendix). We also analysed the use of five social networking sites by seven leading e-cigarette brands over 40 days. Full details of the methods and results have been published.1 Here we use examples from the study to show how e-cigarettes are being marketed to the general public and policy makers. What is being marketed to consumers? Safety and cessation are key marketing themes aimed at smokers. E-cigarettes are described in newspaper articles and advertisements as “a safer and much cheaper method to satisfy a nicotine addiction,” a “healthier alternative,” and “harmless.” They are also promoted as “an indispensable tool in the pathway to quitting.” Although there is some evidence that e-cigarettes are safer than conventional ones and can help with cessation,10 11 the Advertising Standards Authority judged that some marketing claims went beyond the available evidence.12 However, these claims continued to appear in both advertising and editorial after the rulings. Celebrity endorsement in the media—through paid-for testimonials or having their name or image linked to a product—is common (box), resulting in references to stars such as Girls Aloud “puffing on e-cigarettes to cope with the stress of their 10th anniversary tour.” Images of celebrity users and product endorsements are then posted on social media platforms and linked to brand websites and online feeds. Characters on television programmes in the UK such as Eastenders and Lewis have used e-cigarettes, and the products are being promoted through features in shows such as the Alan Titchmarsh Show. Jonny Depp’s character uses an e-cigarette in the feature film The Tourist. Other Hollywood celebrities including Leonardo DiCaprio, Dennis Quaid, and Kevin Connolly have also been photographed with e-cigarettes, and company websites feature pictures of A-list celebrities who use their products. Independent e-cigarette companies and the tobacco industry are promoting products as not only socially acceptable but socially superior, and in the process developing an entirely “new subculture.” Facebook pages for e-cigarette brands include pictures of consumers posing with e-cigarettes with captions such as “MAX-imum style” and articles on “10 ways to look cooler while vaping an e-cigarette.” Vapestick has created a retro-style computer game called Electronic Cigarette Wars. What is being marketed at policy makers? Nevertheless, companies generally worked to oppose the idea of medical regulation. Two independent brands, for example, organised petitions getting consumers to write to politicians to persuade them to oppose EU legislation that would have put controls on e-cigarettes. Large numbers of smokers switching from tobacco to safer nicotine sources has the potential to bring substantial public health gains. However, our audit shows that the commercial exploitation of e-cigarettes is threatening this promise in three ways. Firstly, e-cigarettes are being promoted as lifestyle accessories using a combination of evocative advertising, sponsorship, and celebrity endorsement, all of which have an obvious appeal to young people. This risks non-smokers being pulled into nicotine use, a danger that is exacerbated by the development and promotion of products for first time use. Furthermore, many of these products replicate cigarettes so closely, both in appearance and how they are consumed, that vaping looks just like—and hence models—smoking. Even when the behaviour is unequivocally vaping, it still models the idea of nicotine self medication by inhaling a vapour into the lungs, along with the implication that there is another more dangerous way of doing this. This suggests the potential for e-cigarettes to inadvertently promote smoking. Secondly, the marketing of e-cigarettes risks undermining wider tobacco control policies. The visual similarity between conventional and electronic cigarettes, as well as between smoking and vaping, means that e-cigarette advertising and point of sale activity can be mistaken for (the now outlawed) tobacco promotion. Similarly, the promotion of dual usage undermines one of the key health benefits of smoke-free legislation—the stimulus it gives smokers to quit. These problems demand a swift regulatory response. The Medicines and Healthcare Products Regulatory Agency’s decision in June to regulate e-cigarettes as medicines acknowledges the need for controls, but these cannot wait for the three years it has proposed. Specifically young people need protection, marketing must to be tightly reined in, existing tobacco control policy reinforced, and the tobacco industry explicitly excluded from the policy making arena. One obvious first step would be to regulate e-cigarettes as tobacco products. We thank Diane Dixon and Richard Purves for their contributions to the wider project. Contributors and sources: The authors all have a long term research interest in examining critically the role of marketing in society. They have worked on various public health research projects related to tobacco, alcohol, food, and pharmaceuticals. MdA and GH conceptualised and designed the study and interpreted data. MdA and KA acquired and analysed data. MdA and GH drafted the manuscript; KA revised it. All authors approved the final version. Competing interests: We have read and understood the BMJ policy on declaration of interests and declare that the study on which this article is based was funded by Cancer Research UK. The authors are members of the UK Centre for Tobacco and Alcohol Studies (www.ukctas.ac.uk) and have received funding from the British Heart Foundation, Cancer Research UK, the Economic and Social Research Council, the Medical Research Council, and the National Institute of Health Research, under the auspices of the UK Clinical Research Collaboration. De Andrade M, Hastings G, Angus K, Dixon D, Purves R. The marketing of electronic cigarettes in the UK. 2013. www.cancerresearchuk.org/prod_consump/groups/cr_common/@nre/@pol/documents/generalcontent/cr_115991. 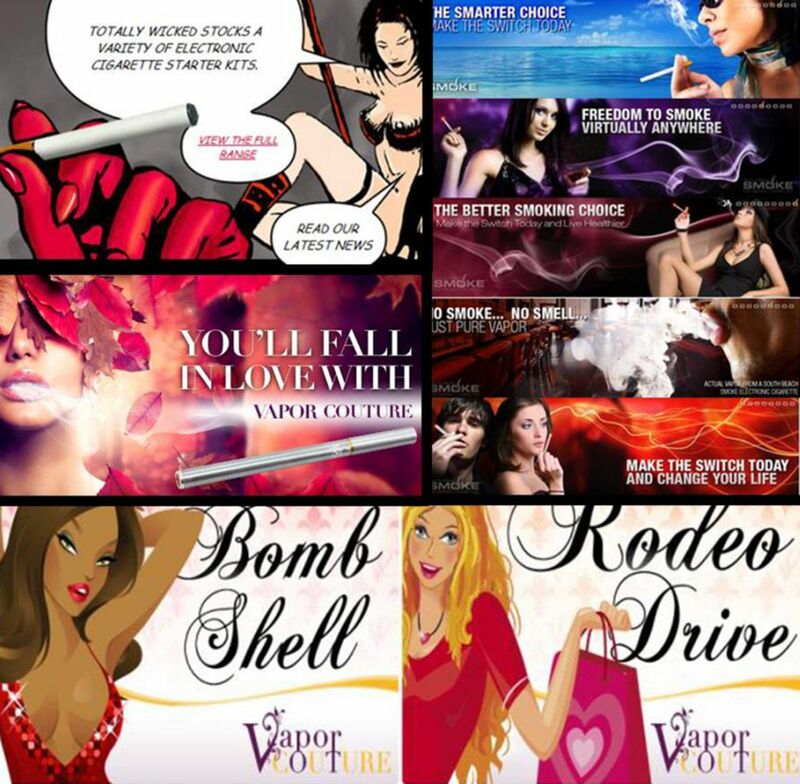 Nicoventures secures a raft of listings for its Vype e-cigarettes. Grocer 2013 Nov 9. www.thegrocer.co.uk/fmcg/e-cigarette-vype-from-nicoventures-secures-raft-of-listings/351328.article. Moon T. Tobacco returns to TV with e-cigarette “deterrent.” International Business Times2013 Sep 14. www.ibtimes.co.uk/articles/506072/20130914/e-cigarettes-tv-big-tobacco-advertising-blu.htm. National Institute for Health and Care Excellence.Tobacco: harm-reduction approaches to smoking. Public health guidance 45. 2013. www.nice.org.uk/nicemedia/live/14178/63996/63996.pdf. De Andrade M, Hastings G. Tobacco harm reduction and nicotine containing products: research priorities and policy directions.Cancer Research UK report. 2013. www.cancerresearchuk.org/prod_consump/groups/cr_common/@nre/@pol/documents/generalcontent/tobacco-harm-reduction.pdf. Grana RA. Electronic cigarettes: a new nicotine gateway? J Adolesc Health2013;52:135-6. E-cigarettes: a moral quandary. Lancet2013;382:914. Cobb NK, Brookover J, Cobb CO. Forensic analysis of online marketing for electronic nicotine delivery systems. Tob Control 2013 Sep 13 [Epub ahead of print]. Rooke C, Amos A. News media representations of electronic cigarettes: an analysis of newspaper coverage in the UK and Scotland. Tob Control2013 Jul 24 [Epub ahead of print]. Goniewicz ML, Knysak J, Gawron M, Kosmider L, Sobczak A, Kurek J, et al. Levels of selected carcinogens and toxicants in vapour from electronic cigarettes. Tob Control. 2013 Mar 6. [Epub ahead of print]. Bullen C, Howe C, Laugesen M, McRobbie H, Parag V, Williman J, et al. Electronic cigarettes for smoking cessation: a randomised controlled trial. Lancet2013;382:1629-37. Committee of Advertising Practice (CAP). Electronic cigarettes. 2013. www.cap.org.uk/Advice-Training-on-the-rules/Advice-Online-Database/Electronic-cigarettes.aspx . World Health Organization. WHO Framework Convention on Tobacco Control. 2005. http://whqlibdoc.who.int/publications/2003/9241591013.pdf.